The Finnish National Gallery in Helsinki is the largest art museum organisation in Finland and a national cultural institution. It is a public foundation and consists of three museums plus the Collections Management Department, including the Archives and Library Section. The Finnish National Gallery collection comprises art works, objects and archive collections, which together form a national collection owned by the State. The Finnish National Gallery archive collections focus particularly on Finnish art, artists, art dealers, museum professionals, researchers, galleries, art institutions and art societies, art phenomena and on the history of the National Gallery. They include images, documents and archival fonds, audio-visual recordings and press clippings. The timespan extends from the end of the 18th century to this day. The Archives and Library Section is responsible for these collections, which grow primarily through donations and proprietary documentation and form the biggest archive collection on Finnish art. The Finnish National Gallery archive collections provide important source material for research and for preparing exhibitions and aim to offer a wide point of view on the national visual cultural heritage. The accessibility of the collections is emphasised through collections management, customer services, and publishing material and curating virtual exhibitions online. 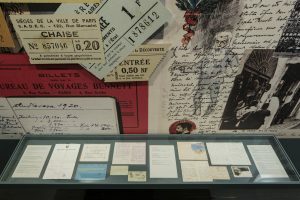 An opportunity to see original archival documents is offered to audiences through the display of material in the exhibitions of the Finnish National Gallery museums. As the National Gallery aims to enhance the study of its collections and the collaboration with universities, a research intern programme for master’s-level art and cultural history students has been launched, with the archive collections playing an important part in it. The artists’ practice room in the collections exhibition ‘The Stories of Finnish Art’ at the Ateneum Art Museum (Finnish National Gallery) showing material from the Finnish National Gallery archive collections. Photo: Finnish National Gallery / Hannu Aaltonen. 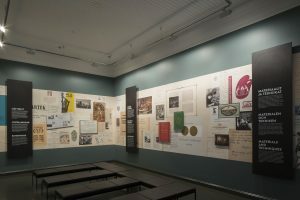 Selections from the Finnish National Gallery archive collections are shown permanently in the collections exhibition ‘The Stories of Finnish Art’ at the Ateneum Art Museum (Finnish National Gallery). A display case containing material related to Finnish artists in Italy at the end of the 19th century.